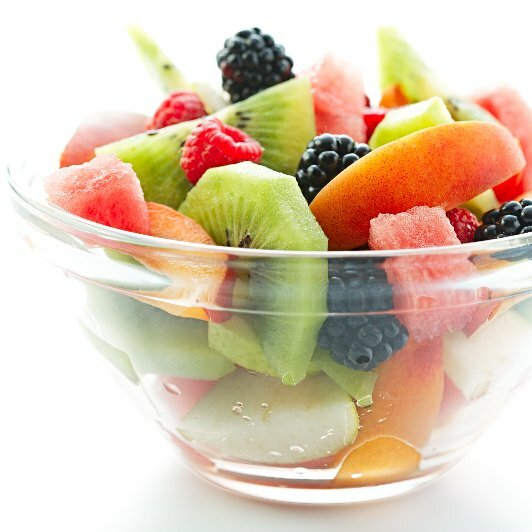 A fruit salad is welcome at the end of any meal any time of year, whether it is a simple family supper or a special occasion. All of these fruit salads can be made well in advance and served just as they are, or with cream or ice cream, crème fraîche, or yogurt. 500g (1 lb) mixed no-need-to-soak dried fruits, eg peaches, mango, prunes, pineapple, figs, apples about 900ml (1½ pints) apple juice 1 vanilla pod 75g (2½ oz ) dried cranberries 75g (2½ oz) dried cherries . 1- Put the mixed fruits into a saucepan with 900ml (1½ pints) apple juice and the vanilla pod. Bring to a boil and simmer gently for about 15 minutes. 2- Add the dried cranberries and cherries to the pan, and continue cooking for about 15 minutes, adding more apple juice ( or water ) if necessary. Serve hot cold.